Facebook cover photos are a perfect example of how social media marketing is different than just regular social media usage. A great personal cover photo can be anything that we think looks great on profile; our business cover photos need to do much more. A Page’s Facebook cover photo needs to be branded and represent our business. It also must be high-quality and perfectly optimized for display; this means knowing the perfect Facebook cover photo size. 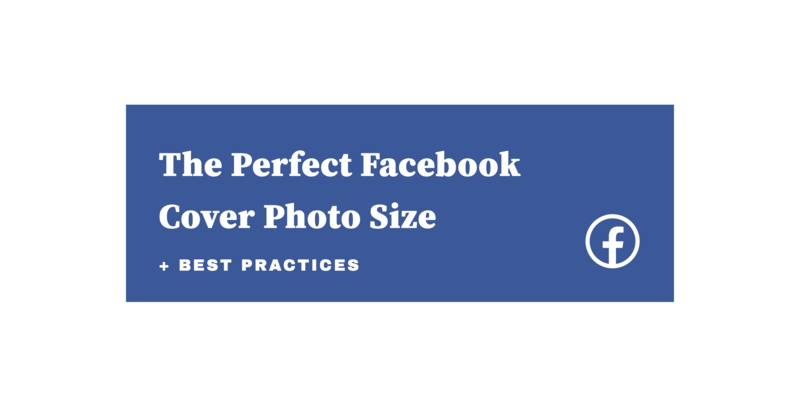 This post is going to take a look at the perfect Facebook cover photo size and best cover photo practices to help your images represent your business exactly how you want. Create a Facebook cover photo for free! According to Facebook, your cover photo displays at 820 pixels wide by 312 pixels tall on computers and 640 pixels wide by 360 pixels tall on smartphones. This is a great starting point, but of course it’s never quite that simple. It’s tricky because your Facebook cover displays differently on mobile and desktop devices. When designing your Facebook cover photo, you need to be careful because the cover image is displayed differently on mobile and desktop. Although, designing with safe zones in mind will get you a Facebook cover photo that will display properly on both devices. Fortunately, Facebook doesn’t stretch and distort an image to fit a certain dimension; it crops it automatically instead. On a mobile device, your Facebook cover photo will crop out the sides, while showing more of the cover photo’s height. Alternatively on a desktop device, Facebook displays more of your cover photo’s width while cropping the top and bottom. With all that being said, we recommend using the Facebook cover photo size of 820 pixels by 360 pixels and designing within the safe zones. This will ensure that none of the critical components of your cover photo are getting cut off on mobile devices or on desktop. If you’re ready to create a Facebook cover photo, our powerful and easy-to-use graphics builder has made this process incredibly simple. 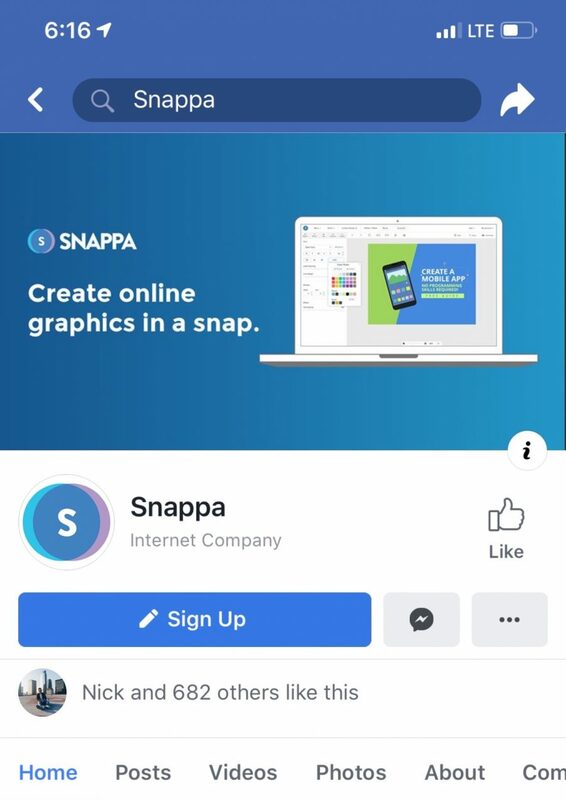 Here’s a step-by-step video showing you how to create a Facebook cover photo with the right size using Snappa. Here are some screenshots to help walk you through the whole process. You can choose the Facebook cover photo pre-set for an automatic perfect cover photo size. Once you’ve selected this option, you can choose from one of our pre-made Facebook Cover templates (which is fully customizable) or create a cover photo from scratch. Even if you use a template, you can upload your own image or choose from our library of images. Add text, graphics, shapes, and effects to any part of the image. All of these add-ons can be dragged and dropped easily; you can define the opacity of each, and choose what layer you want them to show up in. You’ll notice that we also include an overlay showing the mobile and desktop only zones of your Facebook cover so you’ll never have to worry about text and graphics getting cut off. What Should My Facebook Cover Photo Be? Aside from choosing something that is both high quality and relevant to our business, it can be difficult to know exactly what your cover photo should feature. That depends entirely on you, your business, and what you believe your target audience will be most receptive to. Use your cover photo drive sales or lead generation. I believe very strongly than the “social” should come before “marketing” in social media marketing, but that doesn’t mean that there’s no room to promote your business. A cover photo designed to drive sales or leads, combined with a relevant CTA Page button, can get you more results without a lot of extra work on your part. Feature UGC. User generated content is one of the most powerful marketing tools at your disposal; using this authentic type of content in your cover photo can go a long way in rapport and loyalty building. Demonstrate product features & benefits. This can tie into sales, but showcasing product benefits can also immediately set you apart from the competition. Show off your store. If you happen to have a storefront or an office space where you’re located, it can make a gorgeous photo and increase foot traffic. Feature team members & employees. Employee generated content (EGC) can be just as valuable as UGC, and featuring real employees in your cover photo can humanize your business and show the real people behind it. While you can choose any number of images for your Page’s cover photo, there are a few practices you should stay away from. Certain mistakes will detract from your Page, and may even detract from how new users perceive your business. Having too much text. Some text is great, especially if it’s being used for branding. Some photos, though, only have text overlay against a solid backdrop. This is typically not a good move, even if you’re focusing on an insanely motivational quote; instead, your cover photo should actually be an image that’s able to speak (mostly) for itself. Too much clutter. We’ve all seen pictures on social media that have so much going on that looking at them too long might give us a headache. There’s lots of colors and focal points and things to look at. While this might sound appealing at first (it will definitely draw the eye, at least), it’s just difficult to focus on and can even look sloppy. Not taking the current Page format into consideration. Remember when profile pictures showed up in the bottom corner of the cover photo, and sometimes important parts of the image were cut out? Facebook changes it’s formatting fairly often; every time they do, check your photo on mobile and desktop to make sure nothing is getting cut off. Choosing something generic. You want your cover photo to jump out at users; that’s partially what it’s there for. Choosing a generic image that could be about your business somehow won’t have the impact that you’re looking for. Not adding branding. When possible, adding subtle branding like your logo to the image can make a big difference with brand recognition. If you’re looking for some inspiration, look no further than these 7 great cover photo examples from small and online businesses. Drip’s cover photo is a great example of how to use the prime real estate to get more leads. Their photo shows how simple it is to use their product—ease of use is a huge benefit. Immediately next to this, they have a CTA to join their free online training, and even use an arrow and a “Register now” in the bottom corner of the cover photo to draw attention to the CTA button. This allows the entire cover photo to act as a lead gen tool, even sending a user’s focal point onto the CTA. It’s not a surprise that Buffer’s Facebook cover photo is a great example to take note of. Their cover photo is simple and clean, and advertising their new podcast. Again, this is using a prime focal point on their business’s Page to advertise their content. When users click on the cover photo itself, they have links to both the iTunes and Google Play links so users can listen to the podcast on whichever platform they prefer. Another example cover photo we’re going to look at is from Sizzors Hair Salon, and it’s effective for a number of reasons. One of the best things this cover photo does is placing an award badge in the corner of the cover photo. Their “Best of Orlando” award (which includes all the dates they’ve won) is placed prominently. This is a genius move, as it lets all first time visitors know that they’re services are proven to be high quality. This can drive major conversions, especially with a “Book Now” CTA immediately below it. It would be a little tragic to have a blog post on amazing cover photo examples and not have a local photographer on the list. Fortunately, Tamara Knight Photography not only has a wonderful photographer, but some great social media marketing. This cover photo is a fantastic choice, which is impressive considering the sheer number of gorgeous images professional photographers have to choose from. It shows a family that is happy, smiling, and laughing. It’s dynamic, engaging, and feels alive. It automatically makes you smile, which evokes an emotional response and starts connecting you with the business. The family photo not only has an emotional appeal (which holds so much weight), it also contrasts with the business’s profile picture. Since the business offers headshots, featuring a headshot in the profile picture and a family shot in the cover photo shows a range of services the business offers. This will help let customers looking for diverse services know immediately that the photographer can meet their needs. Finally, the branding in this picture is a great example. It’s a faint watermark, so it’s not obtrusive, but it’s still there and present. It makes the Page seem more official, and hammers home that this is a legitimate business with high quality services. Our next Facebook cover photo example is from Bar Method in Winter Park. This location does a fantastic job of social media marketing in general, and is a great source of marketing examples for SMBs. This cover photo makes use of some social image best practices, including using both strong lighting and light colors. The reflection and the woman’s dark hair automatically draws your eye to her, so the focus of the image is still visual and on the business’s services, even though text takes up a large portion of the image. The text itself is a smart choice for three reasons. The first is that it’s motivating and uplifting, which a lot of us (read: me) need before any type of physical activity. It also uses different color and sizes in text to make it more visually dynamic and feel less like a block of text. Finally—and this is the big one—it features their branded hashtag. They do this in the darkest color, which contracts most with the image. This will help new users—both new and returning—know which hashtag to use when sharing UGC, which can help drive engagement. A lot of small businesses have a very distinctive voice and have a specific way they want to present themselves. Bailey’s Grocery in Sanibel, Florida specifically chose a cover photo that represented their brand and how they wanted to present themselves. This picture paints Bailey’s as a small-town, family-run business. It’s got the fresh-picked produce in the back of the truck, which viewers will automatically associate with fresh, high quality foods they can buy in store. The image looks classic, even if it was taken recently, and they introduce themselves as a staple business in a small community. This also helps drive home the brand they’re choosing to present themselves as, which can increase customer loyalty and trust. The last great thing I want to flag on this is the incredible subtle branding on the image. The logo and business name shows up on the door of the truck, so it feels natural in the image, but it’s still there. It’s marketing that doesn’t even look like marketing, which comes across as transparent and authentic. If you’re able to replicate that appeal, do it. Our last cover photo example is from one blood. OneBlood is technically a nonprofit, but their cover photo does a few things so well that I wanted to include it here so that SMBs can use some of the strategies with their own businesses. One blood’s entire cover photo acts as a CTA. It features a picture of a gorgeous smiling child next to a quote about how all the blood donors that donated to OneBlood saved him. The quote isn’t from him, it’s from his mother—the one person who could adequately pull at the heartstrings just a little more. This evokes an immediate emotional reaction, which is a great step towards getting someone to take any kind of action. Above the image is a textual CTA, encouraging users to share their story, their power, and to save lives. This encourages more UGC, which will help them promote their brand, and to donate blood to “save lives.” Businesses that work with non-profits or that have products that can have an emotional impact (insurance can protect your family, for example) can use this strategy. Some amazing cover photos will just be made from graphics, like Buffer’s and Drip’s. Others will utilize actual photographs. Whichever you choose, there are plenty of resources you can pull images from if you don’t have a high-quality image that you’ve taken yourself. Free stock photo sites like StockSnap, Pexels and Unsplash, which offer free stock photos available for commercial use. User generated content, which is free and often available in abundance. Some UGC is extremely high quality, and many users would be honored if you used it as part of your cover photo. The perfect Facebook cover photo size goes a long way in helping you make a great first impression with new users. Your image look good when displayed on both mobile and desktop, without bizarre cropping or the image showing up off-center. Combining the perfect cover photo size with Facebook cover photo best practices can help you build the social presence and reputation that you want to create for your business. What do you think? What does your perfect Facebook cover photo look like? How do you use your cover photo to represent your business? Let us know in the comments below! Use our marketing-ready templates to create your Facebook cover in a snap. Load the perfect dimensions & free stock photos in one-click, and ditch the clunky graphic design software for good.